Ridgewood High School held its inaugural Fiesta Latina on Wednesday, November 8th. Students gathered together to celebrate all things Spanish! This included a combined musical presentation by eighth graders from Giles Elementary School as well as Ridgewood Spanish 1 students. A variety of food samples were shared by Spanish 2 students who have studied the foods of Latin America. Additionally, students expressed their creativity through making Guatemalan worry dolls as well as decorating sugar skull cookies. The candy filled piñatas were a huge hit with kids of all ages. 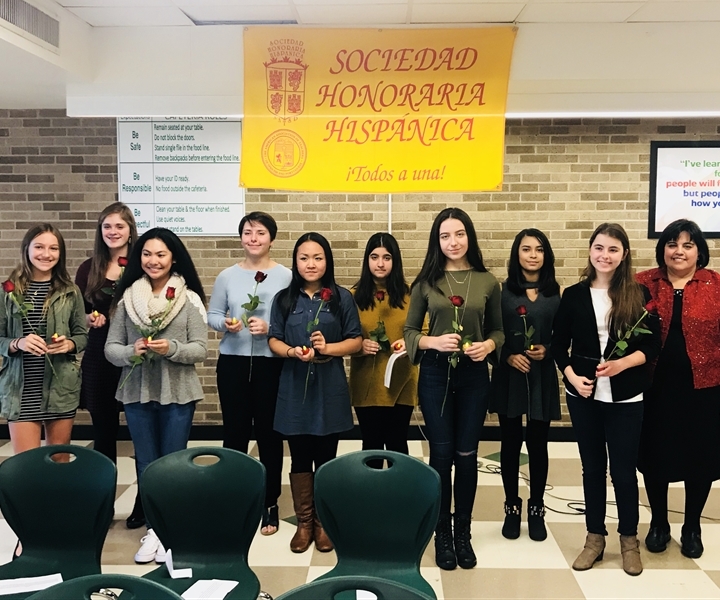 Also part of the festivities, ten students were inducted into the Spanish National Honor Society. The Sociedad Honoraria Hispánica is an honor society for high school students enrolled in Spanish and/or Portuguese. The organization is sponsored by the American Association of Teachers of Spanish and Portuguese (AATSP). The mission of the Sociedad Honoraria Hispánica is to recognize high school achievement in Spanish and Portuguese and to promote interest in Hispanic and Luso-Brazilian studies. Any secondary school student who has maintained an honor average in the study of Spanish or Portuguese for a minimum of three semesters and is in the 10th grade or higher is eligible to be a member of the SHH. This chapter was established on January 22nd, 2017 by Ridgewood Spanish teacher Monica Hansen. The name of the chapter is: Sonia Sotomayor. Their motto is: "All together” and their colors are red and gold.